Koilighugar Waterfall is in Jharsuguda district, Odisha, India. From Gobindpur Chowk in National Highway 200, which is between Jharsuguda and Raigarh, take a right turn. A 6 km drive from there through thick sal and mahua forests will take one to Koilighugar Waterfall. Gobindpur is 20 km from Belpahar. The Koilighugar Waterfall, around 200 ft in height, is in the Lakhanpur, near the village Kushmelbahal. The waterfall is in a rivulet named Ahiraj which originates from the 'Chhuikhanch' forest. 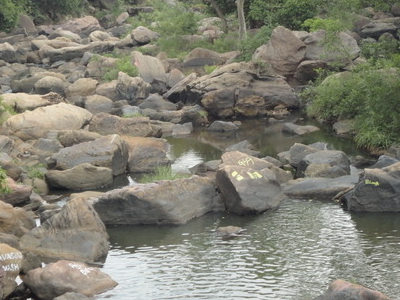 After the fall the rivulet flows west wards to merge into the Mahanadi River. It is a picturesque beauty spot with its sylvan back drop. Inside the fall there is a Shivalingam known as 'Maheswarnath'. The lingam is submerged in water and is not ordinarily visible. For the benefit of the pilgrims, another Sivalingam has been created outside the waterfall.Koilighugar has an annual fair on the occasion of Sivaratri. Here's the our members favorite photos of "Waterfalls in Jharsuguda". Upload your photo of Koilighugar Waterfall!